South Korean renowned artist Kang Ik-joong said Wednesday he will be exhibiting a large-scale installation art piece on the River Thames, London, in September. “Floating Dreams,” the centerpiece art work for the yearly riverside festival “Totally Thames,” will consist of 500 miniature paintings drawn by South Korean seniors who had to flee their hometown across the border during the 1950-1953 Korean War. 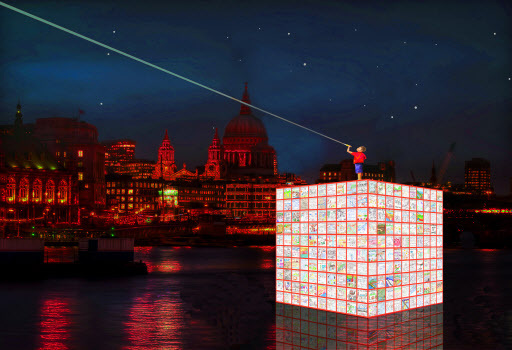 The three-story-high lantern sculpture (11-meters long, 10-m wide and 10-m high), will be illuminated from within and be situated in the center of the river by the Millennium Bridge to light up the city from Sept. 1 to 30. A robot boy, holding a light of hope, will be also installed on top as a symbol of a childhood self of the displaced Koreans who are unable to visit their hometown but are still dreaming about going back. Widely known for installation artwork using children’s paintings to show and support their dreams, Kang has turned his attention this time to the ongoing plight of the refugees of the Korean War, and by extension, those suffering from civil wars in other parts of the world. “We’ve asked 500 elderly Koreans to draw their hometown. Most of them casually started in the beginning and ended up shedding tears while painting, which was really heartbreaking,” he said, adding some of them -- in their 80s and 90s -- have recently passed away. The festival’s founder and art director Adrian Evans, who also attended the briefing, said he is very delighted to have been able to commission Kang for an iconic piece of art for the river. “I was immediately attracted to his work and he seemed to have the vision, sensibility to be able to respond to the very difficult environment in Thames which has a very busy highway, is protected for its historical environment, and has extraordinary tides. All of which are very challenging for an artist,” he said. The director continued, “Kang’s piece is something which I think affects all of us. The challenge of people who have been displaced through conflicts has real resonance.” He said the issue of the displaced people is highly relevant to the British society as well since an influx of immigrants was one of the main reasons for Britain to decide to leave the European Union. To collect the paintings for “Floating Dreams,” Kang started going around the country early this year, with the help of the Institute for Unification Education under the Ministry of Unification. Born in 1960 in Korea, the multimedia artist moved to New York in 1984. In 2001, he exhibited “Amazed World,” a gigantic maze installation art that put together 40,000 children’s works from 150 countries, at the United Nation’s headquarters in New York. “The project’s subject is the displaced, but the bigger theme here is unification. Dreaming about unification is not enough. We also have to consider what we will do after unification,” he said.